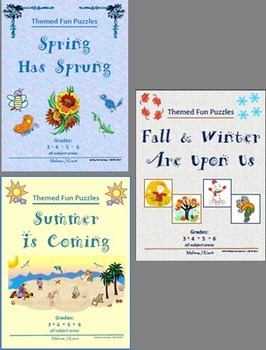 Spring, Summer, Fall, Winter Bundle - Fun Themed Puzzles: FIFTEEN pages of fun puzzles and writing prompts guaranteed to help your learners become better critical thinkers and writers -- all with season-related themes! May be distributed to students by individual teachers. Perfect for 3rd, 4th, 5th, 6th grades, and homeschoolers!